'Fumofumo-san' is an unknown organism living on clouds. They are kind and love soft stuff. They make a group and move together. They make us feel comfortable because they are really soft touches. They are still mysterious about them a lot. Many kinds of ‘Fumofumo-san’ are discovered. We don’t know their details why they have many kinds. The typical theory is appearing by the influence of region. That’s why the place is similar to appear. 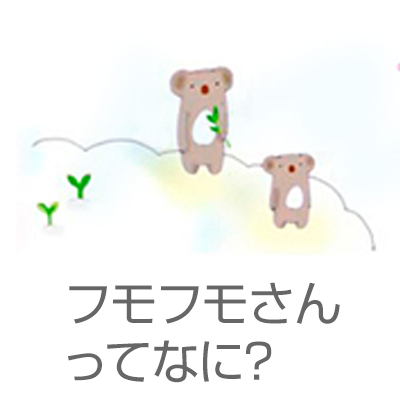 Let’s check the theory examples of Koala that is discovered in autumn and winter 2003. When the clouds pass the sky, a new type of Fumofumo-san is appeared by the influence of something from the ground like waving. We don't still know what condition is gathered and appear the influential wave. Stuffed dolls are known to appear the varieties different colors and size by the treating company. Many animals come from the influential wave from the ground, but unknown variety is sometimes appeared by mysterious influential wave. The influential wave has a theory that appears except the ground and the details are expected the future study. Between Fumofumo-san's fan called 'Fumoler', when counting Fumofumo-san, they don't call one-hiki, two-hiki ('hiki' is used counting small animals in Japanese) but one-fumo, two-fumo, three-fumo･･･(‘fumo’ is taken from the name of Fumofumo-san). Overseas shipment is avalable in Smile Pure. These are countries where FumoFumo-sans have arrived. How do they live in the foreign countries? We believe that they enjoy the slow life.